SMART Garden rooms are becoming THE must-have gyms! Garden gyms are fast becoming popular alternatives for people who enjoy exercising but don’t like visiting a traditional gym. With gym membership fees now averaging £500-600 a year, it’s easy to turn your SMART garden room into a garden gym or yoga studio and save a considerable amount of time and money by working out at home. All you need is several of your favourite machines, weights, a treadmill or a yoga mat and you’re well away! Having your own garden gym means you won’t have to queue to use your favourite machine or attend overcrowded classes ever again. It also provides the option to work out conveniently, privately and in your own time – and there’s no rushing to get off machines. Our stunning range of 6 SMART garden rooms, offices and studios are available in up to 10 sizes with a huge number of features and optional extras, both inside and out – ensuring you can create your ideal gym, yoga studio or workout area with everything exactly how you want it. Our SMART garden gyms are fully-insulated with modern double-glazed doors and windows, as well as insulation in the floors, ceiling and walls to ensure you can workout comfortably all year round and stay warm in the winter and cool in the summer. 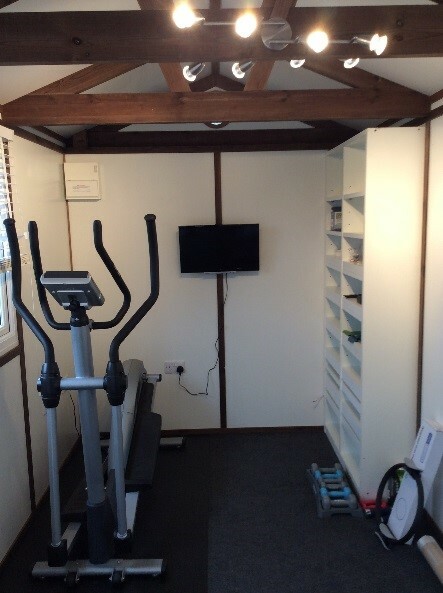 Each of our SMART garden rooms, offices and studios are fully lockable to ensure that your gym equipment and weights are completely secure when you’re not using them.